Magaret Bourke-White in her element as an industrial photographer in 1935. Sean Callahan, an awe struck admirer and author of the book Margaret Bourke-White: Photographer noted, “The woman who had been torpedoed in the Mediterranean, strafed by the Luftwaffe, stranded on an Arctic island, bombarded in Moscow, and pulled out of the Chesapeake when her chopper crashed, was known to the Life staff as ‘Maggie the Indestructible.” But the pioneering photographer and war correspondent turned out to be not quite so indestructible. In 1953 at the height of her creative powers and fame she began to notice alarming symptoms which turned out to be Parkinson’s Disease, then untreatable. She endured a slow deterioration which forced her into semi-retirement by 1957 and ended all of her work by 1968. She endured with the disease for 18 years before dying of it in near poverty on August 27, 1971 in Stamford, Connecticut. Margaret White was born in New York City on June 14, 1904. Her father, Joseph White, an immigrant secularized Polish Jew who was a naturalist, engineer, and inventor. Her mother was Minnie Bourke, an American born Irish Catholic. Both parents, however, eschewed their birth faiths and were ardent free thinkers. The family, including young Maggie and sister and brother, were comfortably middle class, and soon left the city for the leafy small town of Bound Brook, New Jersey, a historic burb on the Raritan River in the north central part of the state. Maggie, like her brother and older sister, worshiped her brilliant father, a perfectionist with high expectations of his offspring. Her artistic mother was also a feminist who imbued her with the notion not to allow herself to be limited by customary gender roles. All the children were imbued with a mission to serve humanity, even save, the world through relentless self-improvement and achievement. While a student at Plainfield High School, Margaret picked up a passion for photography from her father who was fascinated by cameras and interested in nature photography. After graduation from high school she was interested in becoming a professional photographer—a business with few successful women practioners—but followed her father’s advice to pursue science. In 1922 White enrolled at Columbia University in New York to study herpetology—the study of snakes and reptiles. But while at Columbia she took photography classes with Clarence Hudson White, founder of the Photo-Secession movement with Alfred Stieglitz which re-invigorated her interest in the medium. Her time at Columbia, however, was cut short by the sudden and devastating death of her father after one semester. White never returned to Columbia. She restlessly moved from school to school driven by her own often impossibly high expectations of the institutions, her own perfectionism, and a bristling refusal to bow to any restrictions placed on her as a woman. Romance and its failure may also have played a part. White married fellow student Everett Chapman in 1924 and divorced him just two years later. She studied successively at the University of Michigan, Perdue, and Western Reserve University in Cleveland, Ohio, before finally settling in comfortably at Cornell, in Ithaca, New York. Perhaps it helped that Ithaca reminded her of her New Jersey home. When she graduated she left a remarkable portfolio of campus photos for the student newspaper which concentrate on buildings and architectural detail. Despite the odds against her, White was determined to pursue a career as a photographer. 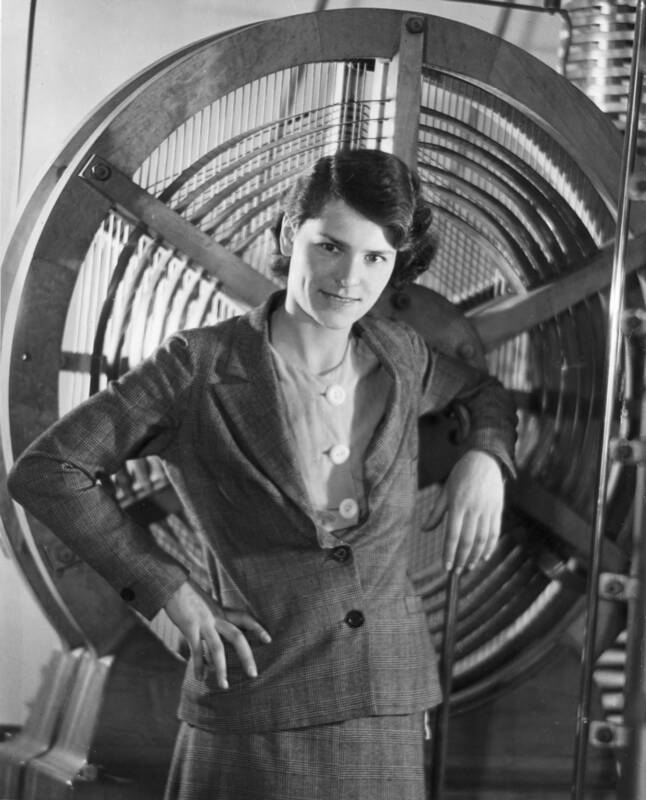 A year after graduating from Cornell in 1927 she established her own commercial photography studio in Cleveland, Ohio where she specialized in architectural and industrial work. Symbolically, she abandoned her married name and the adopted the hyphenated name Bourke-White to preserve her independence and honor her mother equally with her father. Bourke-White's powerful documentation of steel making. In her early days Bourke-White struggled to get commissions. Her breakthrough came when she got a job from the Otis Steel Company to document their production process. Despite the fact that she had been hired by the company, their security agents tried to block her access in the shaky grounds that steel was a defense industry and photos of production could risk the national security and plant superintendents and foremen worried that a mere woman could not stand the intense heat and danger of being close to blast furnaces and molten metal. She got her way around these objections with flirtatious eyelash batting, and when that didn’t work, terrifying bullying. Once in the plants Bourke-White quickly discovered technical challenges. She set up what she thought were brilliant, dramatic shots of steel being poured then discovered in the dark room that the black and white film she was using was not sensitive to the glowing red and orange of hot steel—the molten metal came out nearly black in prints. She solved the problem by lighting her shots by having assistants hold magnesium flares which produced a brilliant white light. The aids sometimes had to be positioned dangerously close to the flowing steel and showering sparks, but she was heedless of their—and her own—safety. The results were stunning. No photographer had ever before captures the dazzling drama of hot steel. When the shots were published, Bourke-White was recognized as a master of her medium. That 1928 shoot led directly to a prestigious new job as associate editor and staff photographer for Fortune magazine in 1929. In 1930 the magazine sent her to the Soviet Union where she became one of the first western photo journalists to document Russian industry under communism. That trip would help make her welcome a decade later when she was posted to Moscow as a foreign correspondent. In 1936 Henry Luce, publisher of Time and Fortune bought the failing old humor magazine Life just for its name. He wanted to launch a new weekly newsmagazine that would rely mostly on photography to tell its stories—a newsreel on slick paper as he envisioned it. Bourke-White, already working for him at Fortune and who had the strong support of Luce’s feminist wife Clair Boothe Luce, was his first hire for the new project. Not only was she a photographer, but she set up the sophisticated photo lab that would be required to process and print the hundreds, often thousands of images that would pour into magazine every week from around the world. When the new magazine hit the newsstands on November 23, 1936, Bourke-White photo of the Fort Peck Dam was on the cover. The new magazine was an immediate success and almost instantly a national institution. Luce was an arch conservative and rabid anti-New Dealer, which was reflected in the editorial content of the magazine. Hardly anyone, however, read Luce’s ranting editorials. They turned to the magazine for the dramatic coverage of the world around them, including the stark poverty of the Depression years. Luce never seemed to learn that the pictures that he printed worked against all of his politics. Pictures by Bourke-White and others evoked sympathy for the plight of workers, and celebrated he triumphs of things like CCC camps and WPA public works projects and actually rallied public support for the New Deal. Luce never learned this lesson and in later years coverage of his photographers of the Civil Rights Movement, the emerging counter culture of the ‘60’s, and the experience of grunts on the ground in Vietnam all worked against his personal political agenda. This Bourke-White photo is still used as a dramatic illustration the American class divide. Bourke-White, who had made her reputation photographing industry, turned more and more to human subjects in her coverage of the Great Depression. In 1937 she toured the South dramatically documenting conditions there. The results were iconic photos like the one published on February 15, 1937 of displaced Black flood victims lined up for food in front of a huge billboard of a smiling white family in an automobile with the tag line “World’s Highest Standard of Living—There’s No Way Like the American Way.” Seldom was there a more deeply subversive photo ever published. Bourke-White lay in wait for her subjects with a flash, and wrote with pleasure of having them “imprisoned on a sheet of film before they knew what had happened.” The resulting portraits are by turns sentimental and grotesque, and she and Caldwell printed them with contrived first-person captions. The resulting book, Have You Seen Their Faces was published by Viking Press, with a paperback version by Modern Age Books following quickly. It pre-dated the more celebrated collaboration of James Agee and Walker Evans, Let Us Now Praise Famous Men published in 1941 by four years. The work with Caldwell also led to romance. The couple married in 1939 and divorced in 1942 largely due to Bourke-White’s lengthy absences on overseas assignments. Those assignments came as tensions in Europe were on the rise. She was dispatched to survey what everyday life was like under the Fascists in Italy, Nazis in Germany, and Soviet Communists. Despite being under tight surveillance and often escorted by handlers meant to make sure that she only took positive photos, her keen eye was able to pick out many telling moments. In the Soviet Union, her earlier visit there led to unprecedented access, including to Joseph Stalin himself in an informal an un-posed session which even caught the usually stern dictator laughing. When War broke out in 1939, Bourke-White applied for credentials as a war correspondent to various governments. She even gave up her full time job at Time, which did not want to send her in harm’s way, in 1940 to become a freelance correspondence sending photos and articles to several American newspapers. She did continue to sell pictures to Time and was eventually rehired by them to be a war correspondent. 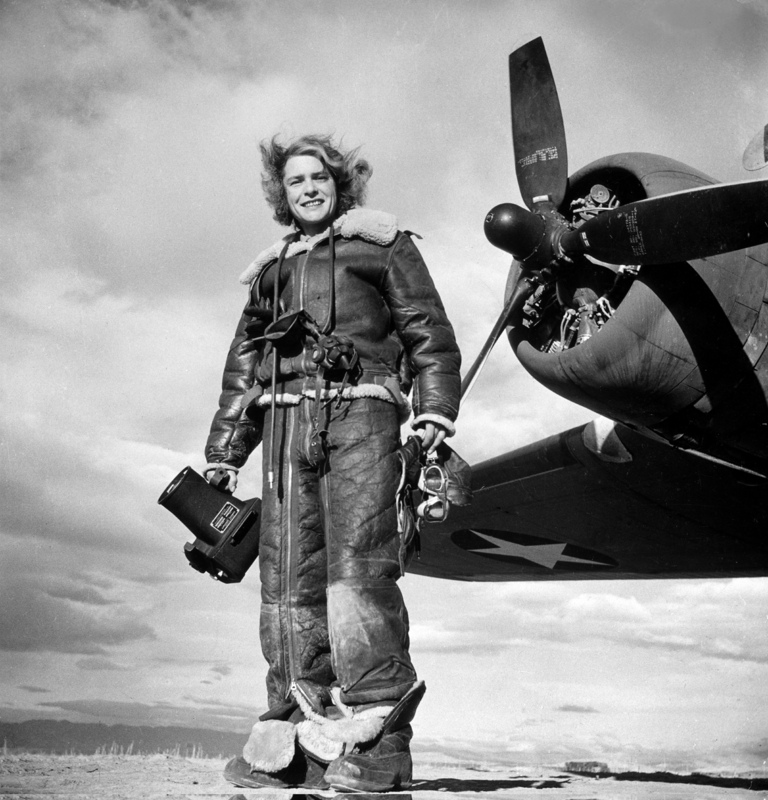 In fact, Bourke-White became the first accredited American female war correspondent. She was back in Moscow when Germany broke the Hitler-Stalin Pact and attacked the Soviet Union on June 22, 1941. In fact she was the only western photographer in the Capital as the city came under Luftwaffe bombardment which set of firestorms. She photographed the burning city from the roof of the American Embassy. Ready to fly with the boys of the Army Air Force in 1942. When the United States entered the war, Bourke-White became the first woman correspondent. She was first attached to the Army Air Force in North Africa and became the first woman to fly on Combat bombing missions. At desert air bases she had to dive for cover from strafing, and dive bombing Stukas. Later she would be assigned to Army infantry and artillery in Italy where the Army was bogged down in a grueling mountain campaigning. She won the respect of the troops for her courage under frequent fire. In between, Bourke-White was onboard the British troop ship SS Strathallan bound to North Africa from England when it was torpedoed and sunk. She turned to the experience into the photo essay Women in Lifeboats which appeared in Life on February 22, 1943. Using a camera was almost a relief. It interposed a slight barrier between myself and the horror in front of me. The photos she took and which were published in Time were among the first and most detailed images of the horror that Americans got to see. After the war she assembled and wrote Dear Fatherland, Rest Quietly: A Report On The Collapse Of Hitler's Thousand Years. It was an eye witness account of devastated Germany after the war in which she displayed scant sympathy for the German civilians she held responsible for the rise of Hitler and still, in the face of overwhelming mounting evidence of atrocities, remained in denial about national guilt and their own responsibility for the wretched conditions to which they had been lowered. It was a tough book—and a highly controversial one. Among Bourke-Whites most important post-war assignments was the independence of the Indian sub-continent and the bloody partition of India and Pakistan. She photographed all of the key players. Her photograph of Mohandas Gandhi emaciated from fasting and sitting at his spinning wheel became one of the most recognizable images of him. There was a stern photo of Pakistani founder Mohammed Ali Jinnah sitting upright in a chair. But it was the photos of the devastating partition violence that stood out. Somini Sengupta, a noted Indian journalist working for the New York Times called Bourke-White’s photographs “gut-wrenching, and staring at them, you glimpse the photographer's undaunted desire to stare down horror…Bourke-White’s photographs seem to scream from the page.” In 1948 she was back in India and again photographed and interviewed Gandhi hours before his assassination. Gandhi and his spinning wheel. These pictures were taken just two years after her experience at Buchenwald. 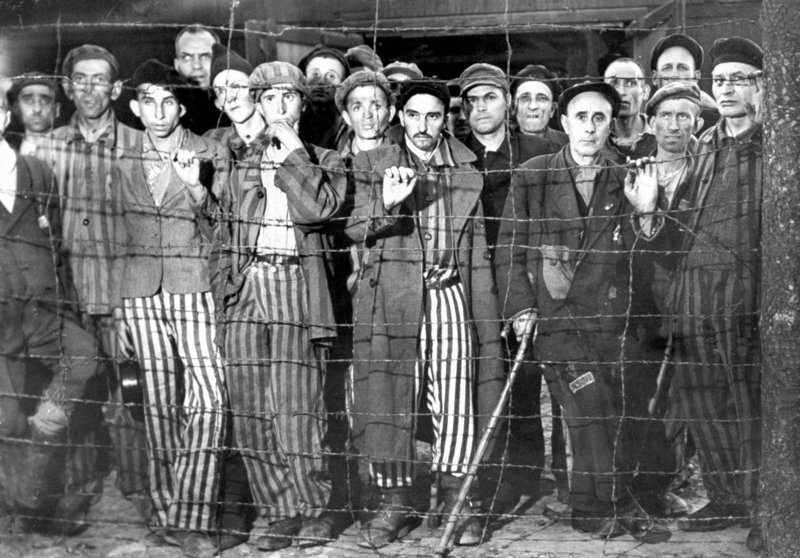 Bourke-White had seen more than her share of the horrors that humanity was capable of. She continued to do fine work for Life until her Parkinson’s forced her retirement. Even then she kept up a limited amount of freelance work. But the tremors of the disease made it increasingly difficult to hold a camera steady or to do the dark room work that she relished. Experimental surgeries to her nervous system in 1959 and 1961 reduced the tremors, but drastically affected her speech. And the procedures could not halt the slow march of her body toward paralysis. Unable to do much with her camera, Bourke-White penned a bestselling memoir, Portrait of Myself published in 1963. She spent the rest of the decade in failing health and increasing isolation in her Darien, Connecticut home. A generous Time-Life pension and royalties from her books and photographs could not keep up with the rapidly mounting cost of her medical expenses and the need for 24 hour a day nursing care. By the time she finally slipped away, she was broke. Burke-White’s photo are on display and in the collections of several museums including the Brooklyn Museum, the Cleveland Museum of Art, the New Mexico Museum of Art, and the Museum of Modern Art in New York as well as in the collection of the Library of Congress. The rise of academic women’s studies almost on the heels of her death helped revive interest in Bourke-White and elevated her to new status as an inspirational role model. Candice Bergen played her in the Academy Award winning film Gandhi in 1982 and Farrah Fawcett portrayed her in a made-for-TV bio pic, Double Exposure: The Story of Margaret Bourke-White in 1989. The Big Blow Up—A Preview of Things to Come?